Hello, everyone! Yesterday I recorded the entire process of my newest drawing, a damask inspired adult coloring page. I draw in Clip Studio Paint, and as I worked, I had a free program, OBS, running on my monitor to capture every line as I drew it. The drawing itself took five hours–probably a bit more–and I sped the video up 45 times, so that it could be viewed in under five minutes. Why so short? Because I had an original song that I wrote that I wanted to use as background music! Plus, because shorter videos are easier to digest/watch than longer ones. The finished drawing will be included in a new project I am working on, and is available as a free download here on my site. I hope that you enjoy watching the video, and if you would like to see more process videos like these, please consider subscribing to my YouTube channel. One of those is a new coloring book. I am starting a new series of coloring books that will be geared toward colorists of all skill levels, from kids to seniors. The first one is almost ready to go. I just need to finish laying out the cover, and do a few last minute checks of the interior. Here’s the work-in-progress cover design so far. My latest coloring book, which will be available this month. 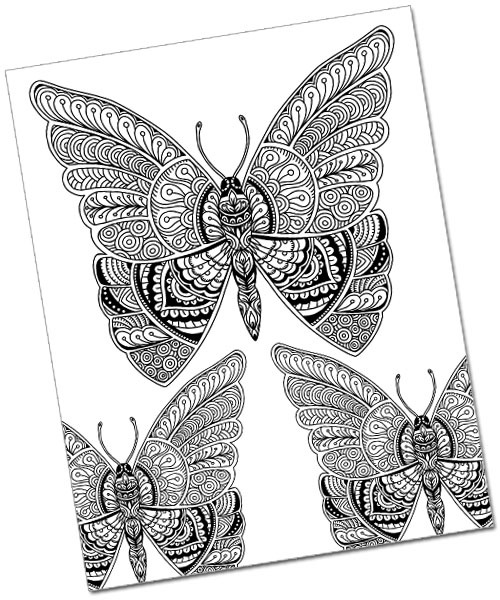 Just a quick update to let you know that I’ve added a new coloring page freebie you to download and color. In honor of Christmas, which is just around the corner (and which I am totally not prepared for! 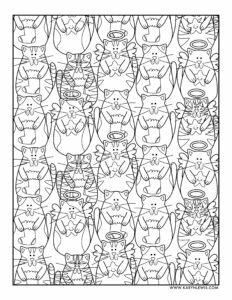 ), I added my Christmas Cats Coloring Page to the freebies. Here is a preview of the page. If you click on it, it will take you over to the download page. It’s available as a .jpg or a .pdf for you to print out and color. Volume one in the Color the Holidays series, “Illustrated Christmas: 25 Holiday Designs to Color” is a collection of Christmas coloring pages digitally drawn by illustrator Karyn Lewis. Inside this coloring book you will find traditional and modern images of the Christmas season including Santa, angels, nutcrackers, snowmen and more. 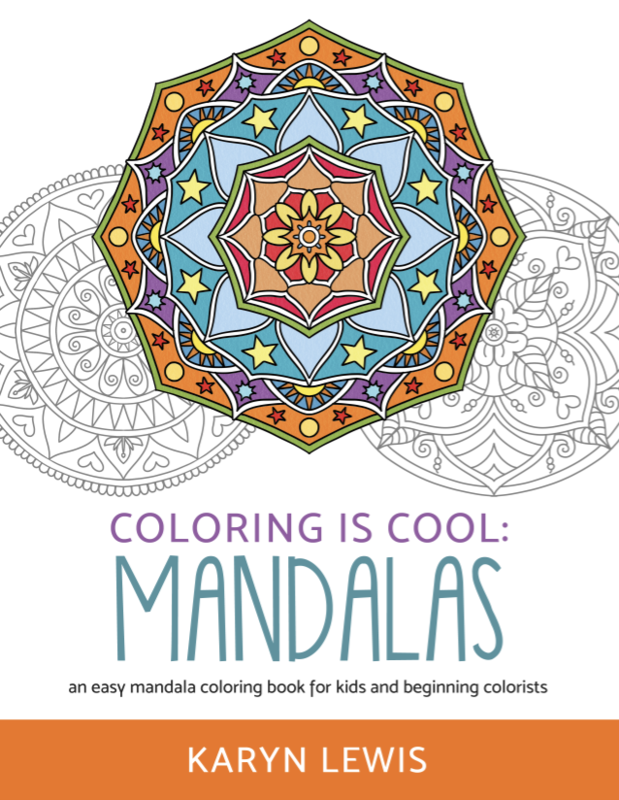 Created with the whole family in mind, this adult coloring book is appropriate for all skill levels. Available on Amazon or Barnes & Noble. Over the years I have done so many illustrations. As I develop new coloring books, I have been enjoying revisiting my old work and redoing them so that the illustrations—many of which are digital paintings—are converted into line art appropriate for coloring. Some of the images I don’t just turn into line art, but I redraw, re-imagine, or redo. Often I add in more detail than what was in the original, so that they are more intricate to color. Sometimes I am not happy with the level or quality of the art. I just finished doing such a redo with the following piece. 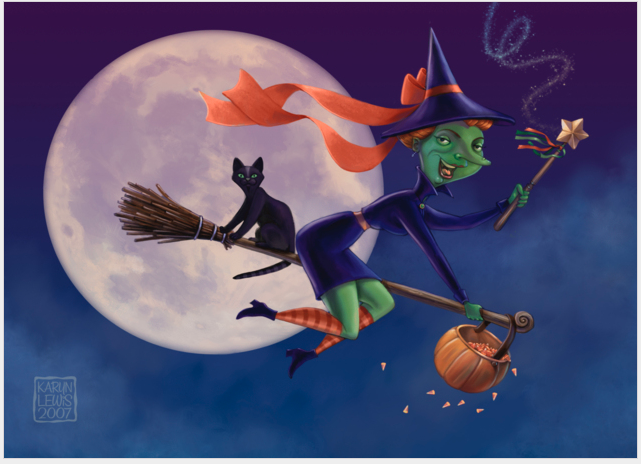 Whimsical Flying Witch Illustration originally done in 2007. I have always enjoyed this piece. I especially love the colors. At the time I was experimenting wit a whimsical illustration style with highly stylized characters with odd proportions. It is still for sale on greeting cards in various locations of the internet. But it never really sold all that well, and I believe it’s because it’s perhaps too quirky. Also, the witch is a bit of a conceptual mess… Her posture and outfit suggests pinup, but she is decidedly matronly. This piece is perfect for a drawing redo! To appeal to more people, I embraced the pinup suggestion of the original and turned the witch from a matron to a lovely young woman. I unified the style, and went with a classic semi-realistic cartoon, and added in more details in the hat and hair and legs to color. 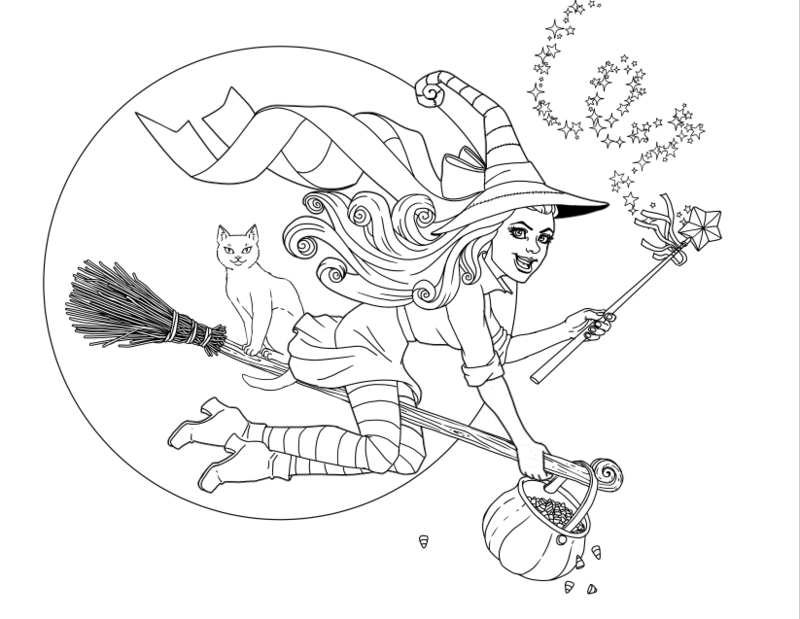 I also changed the kitty cat to match the style of the new drawing, but kept the touches that I liked, such as the basket of spilling candy corn and the magic sparkles from the wand. Eventually this page will make it into a Halloween coloring book that I am working on this October. It won’t be available in time for Halloween, but it will be ready for next year. I enjoyed highlighting the differences between the original images and the redrawn coloring page versions. Stay tuned for more posts like this in the future. Nature coloring pages for spring! It’s been a little while since I have been able to check in with you guys. It’s almost the end of May now, and the school year (which has absorbed much of my focus) is winding to a close. Spring is in full force here in the Midwest finally, and I have been coming out of winter hibernation mode. This return of the flowers, bees, butterflies and green growing things is the inspiration behind my newest coloring project. I’m working on a book of nature doodles, which are intricate drawings inspired by doodle art, Zentangles and, paisleys and henna art. Like my other coloring books, I plan on including about 30 images in this new book, and I think I’m off to a pretty good start. So far I’ve drawn the butterfly and sun goddess pictured here, a tree of life, some lovely mushrooms, flowers, and a dragonfly. 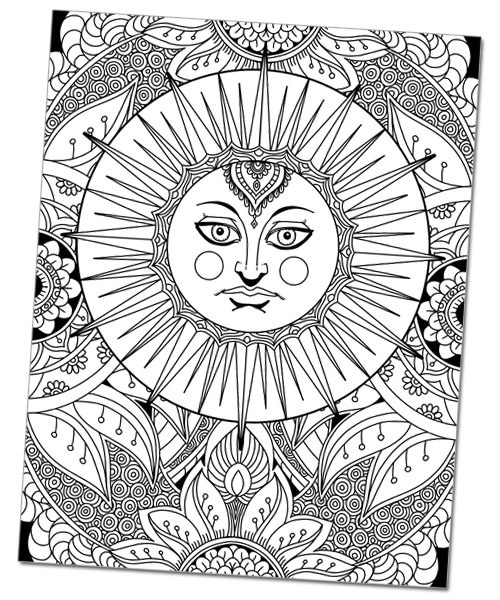 The tree of life is already available as a free download on my Coloring Page Freebies page – and on etsy and in my store here on this site, I plan on offering a selection of digital prints of a few more of the drawings in this book before the book is out. I’ll be updated the blog here as I get closer to the book’s launch, but if you’d like to know for sure when the book will be available to purchase on Amazon, please sign up for my mailing list below.